Hey, Happy New Year! This book was all over Booktube and I just dismissed it. Not because it was a bad book but I just didn’t really pay attention to it and what it was about but I knew people liked it. And I tend to do that with books when they first come out and there is a lot of hype surrounding it. I wait for the dust to settle and then I go check them out. So when I was in the library right before Christmas break I saw this on the shelf of new arrivals. And I thought maybe I’ll take it out and see what it’s all about. Now I know many people like to read books and finish them by the end of each month and I had intentions of doing that but vacation is family time in my house so playing games, talking and eating replaced my reading. My plan to finish this by the end of December and have it be my last book of 2016 was foiled. But have no fear, I have finished it and it is officially my last book of 2016 and my first book of 2017. What an honor. 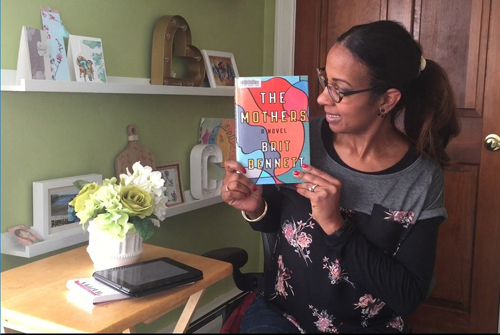 A dazzling debut novel from an exciting new voice, The Mothers is a surprising story about young love, a big secret in a small community—and the things that ultimately haunt us most. Set within a contemporary black community in Southern California, Brit Bennett’s mesmerizing first novel is an emotionally perceptive story about community, love, and ambition. It begins with a secret. This book is about a lot of things; family, friendship and community just like it says in the book description. It is specifically about a black community in southern California and it starts with a secret. This secret lasts the span from the main characters teen years into adulthood and how the secret affects all of the community. I really enjoyed the multiple POVs in this book. It does affect the pacing of the book so if your type person that doesn’t like multiple points of views in stories then this book could be a turn-off. But for me, I felt it only enhanced the story because it gave you a deeper understanding and slowly the author brings you through how the secret touches everybody and how everybody perceives things quite differently. I really enjoyed the book I enjoyed the pacing which strengthened the character development. I enjoyed being with Nadia, the main character as she worked through complex feelings. It felt like a real story. I also thoroughly enjoyed reading the banter of the women who worked at the church. They had their own opinions but you witness some growth in their thoughts as the book progressed. I recommend this book for it was very easy to get into and made you want to keep reading to find out what was going to happen next. The book also made me stop and think about my own perceptions or beliefs and made me question things that I might have initially rushed to judgment thus giving me pause. I think it’s a good book like that might provide lots to talk about in a book club. I am glad I took a chance and picked up this debut novel and I look forward to her future books.